Editor's note: Mark P. Jones, chairman of Rice University's political science department, has updated his rankings of Texas state senators based on their votes during this year’s regular and special sessions. Sen. Dan Patrick, R-Houston, was statistically the most conservative senator, while Houston Democrat Sylvia Garcia was the most liberal. There was a significant gap between the Republicans and the Democrats, but John Carona of Dallas was the least conservative Republican senator, and Eddie Lucio Jr. of Brownsville was the least liberal Democrat. A copy of the full rankings and charts is attached. Jones wrote about the House rankings last month. Political scientists have long used roll call votes cast by members of Congress to plot them on the Liberal-Conservative dimension along which most legislative politics now takes place. This ranking of the Texas Senate uses all 978 nonlopsided roll call votes taken during this year’s regular, first, second and third special sessions. As with past rankings, this uses a Bayesian estimation procedure developed by Stanford University professor Simon Jackman. It is also an update on Sen. Wendy Davis' comprehensive location on the Liberal-Conservative dimension and provides a comparison of two lieutenant governor candidates presently competing for the support of the most conservative GOP primary voters, and another — a Democrat — just entering that race. In the figure, Republicans are indicated by red dots and Democrats by blue ones. The figure is based on the roll call vote analysis and for each senator provides a mean ideal point, referred to below as the Lib-Con score, along with the 95 percent credible interval (CI) for this point estimate. If two senators’ CIs overlap, their positions on the ideological spectrum might be statistically equivalent, even if their Lib-Con scores are different. A table ranking the senators in 2013 from most liberal to most conservative is attached. It is crucial to keep in mind that Republican senators can register Lib-Con scores that are noticeably lower than those of most of their fellow Republicans while remaining conservative. It merely signifies they have voting records that are less conservative than most of their Republican colleagues. The same is true for Democrats on the other end of the rankings. Every Republican senator has a Lib-Con score that is significantly more conservative than that of every Democratic senator; every Democrat’s score is significantly more liberal than every Republican’s. The 19 Republican senators fall into three rough ideological blocs. 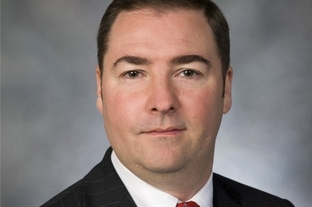 The most conservative bloc consists of seven senators and ranges from Charles Schwertner of Georgetown to Dan Patrick of Houston. Each member of this conservative “magnificent seven” has a Lib-Con score that is significantly more conservative than those of at least half of their Republican colleagues. The group contains four of the five 2013 Republican freshmen: Donna Campbell of New Braunfels, Kelly Hancock of North Richland Hills, Ken Paxton of McKinney and Schwertner. A review of these seven senators’ respective 95 percent CIs reveals that all of them overlap — that none is significantly more or less conservative than any other. 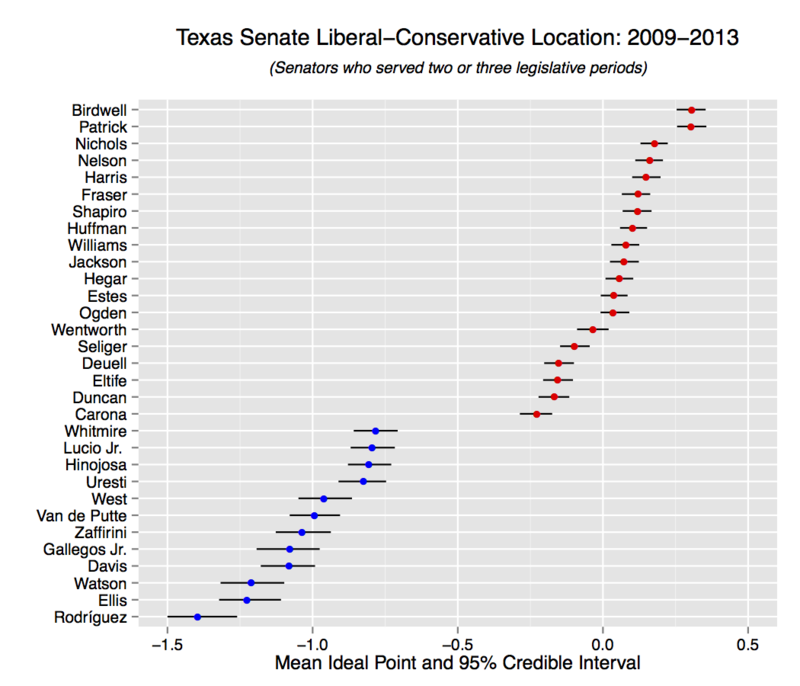 While Patrick and Brian Birdwell of Granbury have more conservative scores than Robert Nichols of Jacksonville and Schwertner, for example, we cannot conclude based on this empirical evidence that either Patrick or Birdwell is significantly more conservative than either Nichols or Schwertner. The seven-member Republican center bloc ranges from Jane Nelson of Flower Mound on one end to Tommy Williams of The Woodlands on the other. It also contains the senator occupying the party’s ideological median in 2013, Joan Huffman of Southside Place, who also held the same status as the GOP’s median senator in 2011. The moderate conservative Republican bloc is anchored on the left by John Carona of Dallas and on the right by Bob Deuell of Greenville. Carona, Kevin Eltife of Tyler, Robert Duncan of Lubbock and Kel Seliger of Amarillo all have Lib-Con scores that are significantly less conservative than those of every senator in the other two blocs, with Carona and Eltife’s scores even significantly less conservative than Deuell’s. 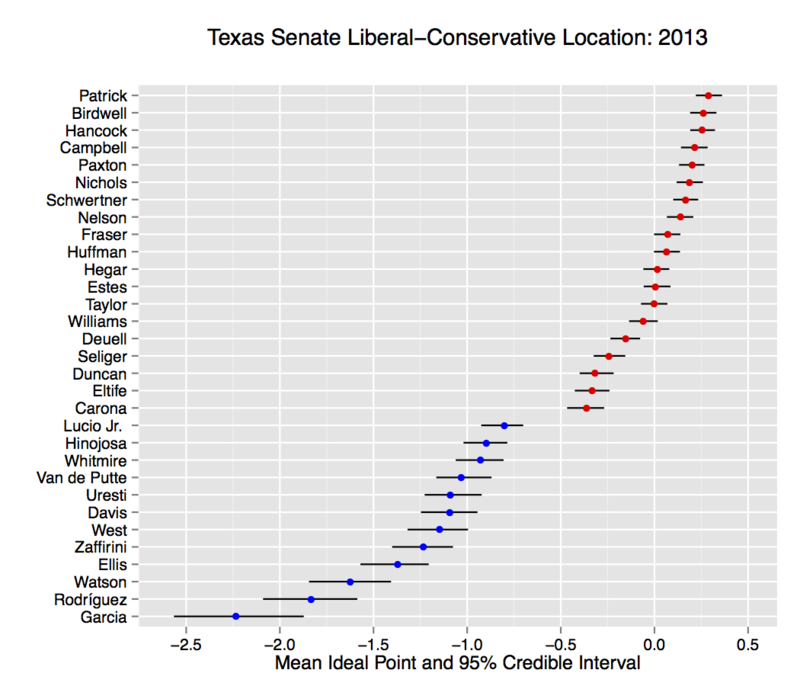 In fact, the data indicate that Carona is ideologically closer to the three most conservative Democratic senators than he is to fellow Republicans Birdwell, Campbell, Hancock, Patrick and Paxton. The 12 Democrats in the Senate range from Sylvia Garcia of Houston on the left to Eddie Lucio Jr. of Brownsville on the right. Garcia’s Lib-Con score is significantly more liberal than that of all but one of her fellow Democrats, while Lucio's is significantly more conservative than that of all but four. After Garcia, the two most liberal Democratic senators are José Rodríguez of El Paso and Kirk Watson of Austin. After Lucio, the two most conservative Democrats are Juan “Chuy” Hinojosa of McAllen and John Whitmire of Houston. In contrast to 2011, when she was the Senate’s second most liberal member, Davis had the seventh most liberal ranking in 2013, with a Lib-Con score located solidly in the ideological middle of the Democratic delegation. Her likely 2014 running mate, Leticia Van de Putte of San Antonio, is the fourth most conservative Democrat. My July analysis of Davis’ voting record for 2009-13 is now updated to incorporate the votes that took place during the second and third 2013 special sessions. It confirms her status as the Senate’s fourth most liberal member during that five-year period among the 31 senators who served at least two terms, with an ideological profile significantly to the left of that of four of her Democratic colleagues. At the same time, that comprehensive 2009-13 analysis does suggest Davis made a decision, perhaps motivated by statewide political aspirations, to move toward the Democratic center in 2013; her Lib-Con score for 2013 was found to be significantly less liberal than her 2011 score. Perhaps no two lieutenant governor candidates are in a more heated battle to win the hearts and minds of the state’s most conservative GOP primary voters than Dan Patrick and Agriculture Commissioner and former state Sen. Todd Staples of Palestine. 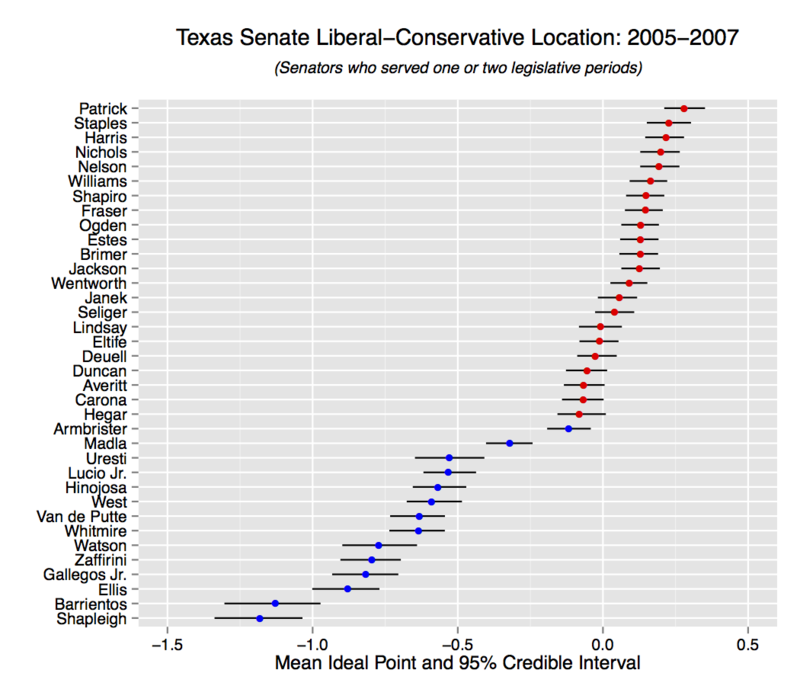 While the Senate tenures of Patrick and Staples did not coincide, the two served in adjacent legislative periods, Staples in 2005 and Patrick in 2007, making it quite feasible to use joint-scaling methods to accurately compare their respective locations along the same Liberal-Conservative dimension. This joint analysis of the 2005 and 2007 legislative periods finds Patrick and Staples had the two most conservative Lib-Con scores among the 36 senators (22 Republicans and 14 Democrats) who served in either the 2005 session alone (five senators), the 2007 session alone (five) or both sessions (26). Patrick and Staples’ respective CIs overlap considerably, indicating that, based on their most comparable roll call voting records, neither can credibly be considered noticeably more conservative than the other. In sum, Staples’ voting record was as conservative as Patrick’s, and vice versa. Mark P. Jones is the James A. Baker III Institute for Public Policy’s Fellow in Political Science, the Joseph D. Jamail Chair in Latin American Studies and the chairman of the Department of Political Science at Rice University.